Bhutan, the last Shangri-la, is one of the smallest economies in the world. The feel and look of the country is picturesque and that out of a pretty book on �Nature�. Its clean air adds a fresh dimension to the reason of visit to this beautiful country. The agricultural economy thrives on small scale farming, producing crops like barley, con, citrus fruits, etc. Animal husbandry includes cattle rearing, pigs, sheep, yaks, etc. Tourists are welcomes with open arms. Their largest source of foreign exchange from tourism, gives an impetus to their developing economy. Bhutan gives a feel of an old-world charm with their handicrafts which are produced locally, using a majority of the man-power. The beautifully woven Bhutanese crafts are all handmade. The key infrastructure projects like roads, etc are fast developing, which are being aided by their neighbours, like India. 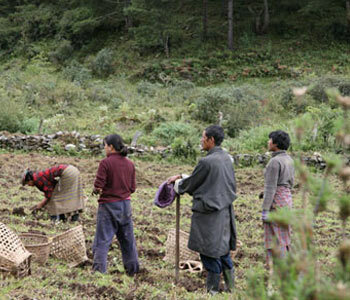 A large proportion of Bhutan exports include agricultural product, apples, oranges, cardamom, potatoes, asparagus, and mushroom. The nation is slowly catching up in hydroelectric power sector which accounts for a descent source of income for the government.